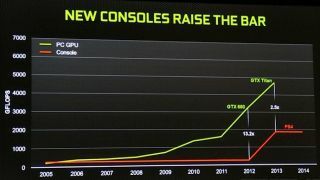 Nvidia graphics may not be powering a single next-generation game console, but the chipmaker is okay with that, since the closing performance gap ultimately benefits PC developers. The Verge reported Wednesday that graphics chipmaker Nvidia harbors no grudge for being left out of the next-generation game consoles from Microsoft, Sony and Nintendo. With the Xbox One, PlayStation 4 and Wii U all powered by AMD, Nvidia Senior Vice President Tony Tamasi appears to be looking at the glass as half full in terms of how they might actually help PC software publishers. "The PC will keep growing, but the consoles will give us that next bump," explains Tamasi. As proof, Tamasi offered up the above chart, which shows how Sony's PlayStation 4 graphics have helped close the gap against the Nvidia's more expensive cards like the GeForce GTX Titan. This narrowing gap ultimately benefits developers, who won't have to do as much heavy lifting when it comes to moving their content from one platform to another. "Developers can now build really awesome content that can then scale to the PC," Tamasi elaborated, adding that "consoles are great because they catch up from a features perspective." Ironically, the report reveals the "most visually compelling games" at this year's E3 actually run on Windows, suggesting that Nvidia's graphics could have an advantage for years to come. Find out the latest information on the PlayStation 4 and Xbox One!